The original Central High School Building at 13th and Market. Image from the Library Company of Philadelphia. There are no female graduates of Central buried in The Woodlands; this is because the majority of Central grads buried here lived in the mid to late 19th and early 20th centuries; Central didn’t go co-ed until 1983, when the Philadelphia Court of Common Pleas declared the school’s longstanding male-only admission policy unconstitutional. Six girls integrated the student body that year, and today over half the student population—including me—is female. There are dozens of medical professionals who went to Central buried in the Woodlands. This is likely because Central’s 19th century curriculum focused on the sciences, which led many students to Jefferson Medical College (now Thomas Jefferson University). These students were able to attend medical school immediately following their graduation from high school without attending college because of Central’s unique ability to confer bachelors’ degrees upon graduating seniors. This practice continues today; all seniors with a 90% average or above receive a B.A. when they graduate from Central, but this degree is unfortunately no longer as valid as it was in the 19th century. Thomas Eakins' school picture, taken at Central High School, 1861. From the Pennsylvania Academy of Fine Arts. Eakins is one of the most well-known of the Central’s alumni, as well as one of the Woodlands’ most notable residents. During his time at Central, Eakins focused on what the High School deemed practical skills, studying in mostly technical and scientific fields. Although his art education at Central was limited, it was there that he was introduced to the fields of science he would famously go on to depict later in life. Eakins is known for his paintings of medical scenes; his most famous work, The Gross Clinic, portrays the famous surgeon Dr. Samuel Gross presiding over a surgery at Jefferson Medical College. Keen, a Central graduate buried in the Woodlands, was the first American brain surgeon. He worked closely with a number of Presidents, performing a secret operation on Grover Cleveland to remove a jaw tumor. Although President Cleveland would never visit his surgeon’s alma mater, two other presidents, James K. Polk and Theodore Roosevelt, would visit Central in the years following Keen’s graduation. Top Right: The Keen Clinic depicts Dr. Keen teaching in the surgical amphitheater at Jefferson Medical College. 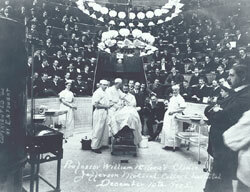 The Gross Clinic by Thomas Eakins depicts Dr. Samuel Gross teaching in the same amphitheater; both Gross and Eakins are buried in the Woodlands. Image from Jefferson Medical College. Bottom Right: President Theodore Roosevelt at Central High School. From the Mary Gaston Barnwell Association. Self Portrait by Rembrandt Peale. From the Detroit Institute of Arts. Woodlands resident Rembrandt Peale (Section F, Lot #55) was the son of renowned portrait painter of the American Revolution, Charles Willson Peale and was a distinguished painter himself. After studying under Benjamin West in England and gaining an international reputation for his work, Rembrandt returned to the U.S. where, in 1841, he assumed the post of professor of drawing and writing at the young Central High School, which at the time was desperately in need of faculty members for its growing student body. In addition to Rembrandt’s work at the High School, Charles Willson Peale’s grandson, Harry Peale (Section L, Lot #25-29), attended Central and is buried in the Woodlands. The Artist in his Museum, a self portrait by Charles Willson Peale. From the Pennsylvania Academy of the Fine Arts. The Peale family is also geographically related to Central; the family’s Germantown estate, Belfield, covered much of the ground now occupied by Central. It was from Belfield, just a few hundred feet away from Central, where Charles Willson Peale corresponded with Thomas Jefferson at Monticello. When Charles Willson Peale sold his estate, it was bought by entrepreneur William Logan Fisher. Fisher’s woolen mills in Germantown once produced 90% of the country’s hosiery; the crowning glory of his enterprise was his largest mill, Wakefield, which stood immediately southeast of the grounds that now house Central. Although the mill burned down in 1985, Wakefield Park now stands in its place and serves as a practice space for Central’s Ultimate Frisbee and Cross Country teams. The Drexel Mausoleum at the Woodlands, where Anthony Joseph Drexel, Joseph William Drexel, and other members of the Drexel Family are buried. Joseph William Drexel was the director of the Metropolitan Opera, President of the New York Philharmonic Society, a trustee at the Metropolitan Museum of Art, and a student at Central High School. Drexel’s brother, Anthony Joseph Drexel, was the founder of Drexel University, and both are buried at the Woodlands. Not only did members of the Drexel family attend Central, but today, more than 50 members of Central’s graduating class matriculate at Drexel annually. Bust of William Bucknell. From Bucknell University. William Bucknell became wealthy through his endeavors in the finance and railroad industries. Instead of keeping all his money for himself, however, Bucknell donated one tenth of all his earnings to educational and religious organizations. By the end of his career, Bucknell is said to have donated $1,000 a week, each to a different charitable cause. On one occasion, Bucknell made a $50,000 donation to the then University of Lewisburg and, in 1887, the University was renamed Bucknell in honor of this generous donor. Bucknell is buried in the Woodlands, and Central High School frequently sends students to the university named in his honor. Alexander Dallas Bache, the first President of Central High School. Image from the National Oceanic and Atmospheric Administration Archives. As Philadelphia institutions, both the Woodlands and Central High School are inevitably connected to the city’s very own Renaissance man, Benjamin Franklin. Franklin’s great-grandson, Alexander Dallas Bache, founded Central High School and served as the school’s first president. In addition to his work in education, Dallas Bache was also a Second Lieutenant of the Corps of Engineers and worked as a surveyor, creating detailed maps of the American Coasts. Hartman Bache (Section I, Lot #829-831), also a grandson of Franklin, was likewise a prominent civil engineer and General in the Corps of Engineers. Hartman is buried in the Woodlands along with hundreds of graduates of the high school his cousin founded. Peter Frederick Rothermel Sr. was a celebrated Philadelphia artist who painted historical scenes ranging from De Soto Discovering the Mississippi to the famous Battle of Gettysburg, which hangs in the Pennsylvania State Museum. Rothermel’s son of the same name attended Central High School and went on to become the Philadelphia District Attorney. Battle of Gettysburg: Pickett's Charge by Peter Frederick Rothermel. From the Pennsylvania Historical and Museum Commission/State Museum of Pennsylvania. William Abbey was the first student ever listed on the roll at Central High School. He went on to become a merchant after graduating from Central. His son, Edwin Austin Abbey, was a famous illustrator and muralist in the late 19th century, best known for his paintings of Victorian and Shakespearean scenes, as well as for his mural on the Pennsylvania State Capital Rotunda. William M. Abbey is buried in The Woodlands along with Charles M. Cresson and James A. Kirkpatrick, both members of Central’s first graduating class of 63 students. When Central graduates its 275th class this year, nearly 500 students will receive degrees.